Notice I say optional. You do not need to create a product or service at all. You can just sell other people’s stuff and earn a commission. I show you how to do this in chapter 7 – Sell other people’s stuff but there is plenty to learn here about general internet marketing so DO NOT SKIP THIS CHAPTER. · eBooks – eBooks are just the electronic version of a physical book. So if you wrote “Once upon a time blah blah blah….” in Microsoft Word or any other word processor then this would be an eBook. If you can send a data file via email that has words in it then this data file is an eBook. · Weekly & Monthly Subscriptions – If you can provide information on a daily, weekly or monthly basis that is deemed useful then you can charge for it. There are many subscription sites. I sell property investment information others sell credit data, pictures, self help videos, dating contacts, classified adverts, auction data, price information etc. Information that can assist people in making money usually work quite well. · Special Reports – This is like an eBook but it doesn’t have the normal contents and chapters. Special reports I define as anything else other than an eBook. So its information you want to sell as a one off hit that you deem to be of value to someone else. So my report about the USA is my research about a certain area and why you should invest in it. 4. The sale happens automatically with no human input. If someone chooses to buy your product (which I show you how to convince them to buy further on) they can get the product from you with just a few clicks and the website sends them the product automatically. So it really can be a cash cow chucking out money in to your bank account. So there is no need for any warehouses, overdraft facilities, employees or packaging. It all happens automatically. · What do you know that someone else would find useful? Useful enough to pay for? · Do you have a particular skill, tip, trick, nack or know-how about a certain subject? · Have you learnt something that you are quite sure no one else knows and could help people in whatever they do? There are so many things you can write about and this book is not about telling you what to write. As explained in chapter 1 you need to get an idea and then the product you decide to develop will be obvious. Most internet start ups usually buy in from a wholesaler and sell on at a profit. My friend Adam who taught me a lot about the internet buys his products from Canada and sells them in the UK, Germany and New Zealand. It’s a great way to start a business as your product is already there – you’ve just got to sell it! If the product is a good one then it should sell itself. However just because its an easy way to start doesn’t mean it will work. The product could be so good that everyone is selling it and you’ll just be joining the queue! Another friend of mine actually makes the jewellery items and sells them direct to the public via her website. So the number of items sold will be restricted by how many pieces she makes unless she hires in staff to do what she does. But on the flipside her pieces of jewellery are unique so she has no worry of direct competition as long as her pieces are sufficiently unique. So you can do it either way – you can buy in the product or create the product from scratch. It all depends on your idea for your website. You could even do both. You could make your own products and buy in and sell on other products. · Do you get asked by your friends or family to do something like fix their mobile phone or toilet etc that you could actually charge for? · Can you teach people a certain skill that you possess which other people desire to have? · Do you have access to contacts that can provide a service which you can add a commission to? · Are you qualified in a professional trade where you can get extra customers by promoting this service on the internet? One of my friends Chris is a dab hand at fixing computers. He just loves fixing computers. He gets some kind of buzz out of making something seemingly dead come alive. He has a website explaining his service of fixing computers that do not work which gets him customers in a 15 mile radius of where he lives. Another friend of mine Mandip has a website about evicting tenants for private landlords. She works as a housing officer for a housing association and she knows eviction laws inside out. So in her spare time she does all the paperwork involved in evicting tenants and gets all her clients by promoting her service on the internet. She also helped me kick start my eviction service too! Again the services you develop will be as a result of what idea you have decided to pursue determined in chapter 1. I hope from mine and my friends examples help stimulate your brain to come up with some creative and innovative products and services. So once you come up with the products and services you then need to sell them. A business is nothing without a sale – its simply an idea. So you need to get to make sure you getting your selling process right. The amount of great products and services I see that never result in a sale amazes me. The creators believe that the product is so great that it doesn’t need to be sold – WRONG! This may be true for established products and services but for every new product or service it needs a “sales pitch”. Of course, you can put any old rubbish on your website; but if you want sales pitch that actually entices your visitors to buy your product or service, you need to make sure you're using copywriting techniques that are proven to produce results; results that will earn you cash! I know how effective this needs to be, because I’ve been selling on the internet for over 3 years, in which time I have learnt what works and what doesn’t. If I knew what I knew now then I reckon I would have earnt over £1m more in sales but hey I can’t complain! I have been using a formula on my own websites which I want to share with you. I have quadrupled my sales over the last two years by using my tricks which I have learnt through experience and other internet marketers. It’s true, the way you sell it determines how many of your products and/or services you’re going to sell; and ultimately how much cash you’re going to rake in. In this chapter I'm going to show you the 3 critical elements that will help you structure your sales pitch and how to test what you create to see if it’s working. The more you refine your sales pitch the better it will work. There are elements of a sales pitch which even a child could understand. That’s the beauty of sales. We all understand it on an instinctive level as we have all been sold to. FACT: A brilliantly thought out sales pitch can potentially ROCKET your sales! People fundamentally sell over the Internet because you have the chance to communicate with millions of people, a target audience previously untouchable. Conversely, you don't have the opportunity to meet these potential customers in person to tell them why your product or service is exactly what they're looking for. It sounds simple but it’s a fact, you need to sell something to someone before you can even think about gaining the sale. A brilliant sales pitch posted on your website will build trust and highlight how what you are selling will benefit the consumer. In a nutshell your sales pitch is your top salesperson so treat it like one! Initially you need to identify which kind of sales pitch is going to be more suited to what you are selling. Is it a long, descriptive pitch (greater than 750 words) or a short, punchy pitch? then you definitely need long sales pitch to try and reel your audience in. So determine which category you fall in to before you get in to the nitty gritty of writing your sales pitch so you can establish whether you need to write a 750+ word master piece or several mini wonders less than 750 words. Once determined there are 5 elements you should be aware of when writing your sales pitch which keep you well ahead of your competitors. Write To Your Target AudienceYou have to define your audience beyond simply "people on the net". You must know EXACTLY who are the people that will buy your product or service and then target your sales pitch to precisely what they're looking for. So you’ve got to ask yourself – Who is my target audience? Can you make your product/service fit into their problem as a viable solution? If you don't know or have an indication of the answers to the above questions, you need to go back and do a little bit more research. All of this is pivotal to making your effective sales pitch. Once you’ve got an idea of who they are then write to them in a style that they will understand and that connects with them. So for example if it’s for teenagers then keep it current and less formal and if it’s for professional business people then keep it more formal. Write An Exciting Headline Headlines are key. The most effective headlines promise an answer to the problem your visitor has arrived on your site trying to solve. "Get an Accountants Reference within 24 hours sent direct to your chosen lender or get 200% of your money back!" So have an exciting headline in speech marks in size18+ font which explains what the reader could expect to get if they read on further. Keep your headline relevant, simple, and to the point. This will encourage your potential customer to keep reading! The better the headline, the more people who will read on, the more people who will (with the right sales pitch) will consider buying and ultimately the more people who will buy! I would use underline, italics and bold on the key words to emphasis what you are promising because it acts as a trigger to keep them reading on. Bold, Italic and underline act as mini bolts to keep the reader’s interest and combined with the large font makes the headline almost shout at you! If you can hit ‘em with a good opening headline then 25% of your work has been done. Whatever you can just to keep the reader reading. You’ll be amazed at how quickly we get bored with reading paragraphs of text all of the same size, font and decoration if we are not sure if the text will be beneficial to us. We all follow the motto “If in doubt bail out!” because we just don’t have the time to really find out if the text is useful in anyway. This is why you have to spoon feed what you are saying to them by using a few frills. You need to earn your potential customer’s trust….and quick! When using websites you cannot afford to have long spiels about irrelevant experiences you’ve had etc – you need to establish your credibility for what you’re saying straight away. Tell them what you’ve achieved in the past: Are you fully qualified in the area you are selling? Written any published works relating to it? Any positive media publicity you’ve received? If so, put it in – it will all help! Relate to your potential customer: Is your potential customer’s problem a problem you once faced? Are you now offering them a solution as a direct result of an experience? Tell them if that’s the case and tell it in a story fashion – as I’ve said before everyone loves a story. Gather and use testimonials: People want to know that other people have used your product and benefited. When it comes to using your customers’ feedback in your sales pitch you have to get the right blend of specificity and punch: not all testimonials are created with equal punch. The most effective testimonials highlight the benefits and results your customers have achieved after buying your product or service, so potential customer’s will see that you deliver what you say you will. If you haven’t got a testimonial then ask for one! If you can give your product away then do so in exchange for a testimonial (and make sure you get a good testimonial!). Add a strong guarantee: A strong guarantee shows you stand behind what you're selling. This will reduce your potential customer’s suspicions and increase their chances of buying from you. “…within 24 hours sent direct to your chosen lender or get 200% of your money back!" By offering this guarantee you are giving credibility to your service and making a promise that appears too expensive for you not to fulfil! A feature is something specific to the product or service. So for example a TV being able to display images in colour has the feature of being colour. A benefit is something the user actually receives from the feature. So in the colour TV example the benefit for the user is that they get to see a more true to life image than a Black & White TV. Then I would include the above features in my website and emphasis the benefits that my service brings to them. Hoping along the way I would connect with them through my sales pitch so that they pick up the phone to call us or email us for further information. Ok, so you've got your potential customer’s attention and hooked them through the sales pitch by explaining the features and benefits of your product or service. So what now............ask for the order and turn them from that potential customer I’ve referred to into a paying customer! You have to make clear exactly what they have to do to get your product or service. I have seen many a sales pitch fall at this final but most crucial hurdle. They do not ask the reader to do anything. They assume the reader will look to the left menu bar and see the phrase “Order Now” but reader’s don’t! Only if your product is so damn good that they’re itching to buy your product because they have heard about it from someone else (in this case you wouldn’t even need a sales pitch!) would they even hunt around for the “Order Now” button. “To book your appointment, please click the ‘Buy Now’ button below!" "Click here to take advantage of this limited offer!" So asking them for the order and letting them know they will get some kind of special price or free gift if they act now encourages them to buy now rather than miss out on the chance. So in summary the audience, headline, credibility, benefits & features and asking for the order are the 5 essential elements you need on your website in order to make A FORTUNE! Add these using the techniques explained and you'll create a top salesperson working 24/7 with no salary costs! Make sure you care about the presentation and image of your product or service as much as you do about the sale of them - constant review and analysis will breed results and results mean MONEY! When it comes to your business on the net, your own sales pitch is unique to you and the only chance you have to communicate directly with your potential customers, telling them WHY they should buy from you as opposed to someone else. Not many websites use these 5 critical elements and as such you're already one step ahead of the game just by making sure your copy includes the essential elements discussed here! 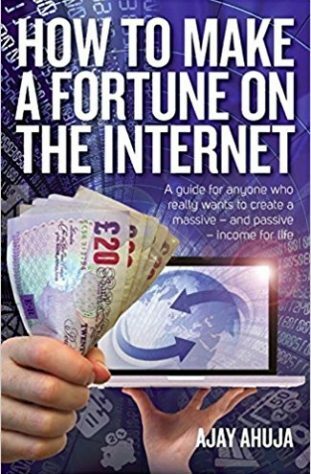 There are not a lot of people using the Internet in the UK to make A FORTUNE so your destiny is in your own hands. By testing the different parts of your sales pitch regularly you'll know how well your site is performing and what, if anything, needs to be changed to prevent potential sales from going down the drain.